Fruit basket Miracle | Send flowers to Ukraine, Kiev | Доставка цветов на Украине, в Киев. 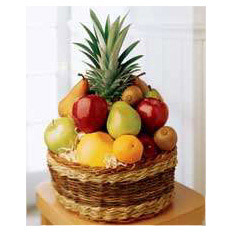 Gift a Fruit basket "Miracle"
Items may vary depending on your personal wishes and the availability of fruits for sale. Add flowers and a greeting card from our Catalogue. Flower delivery service all over Ukraine.